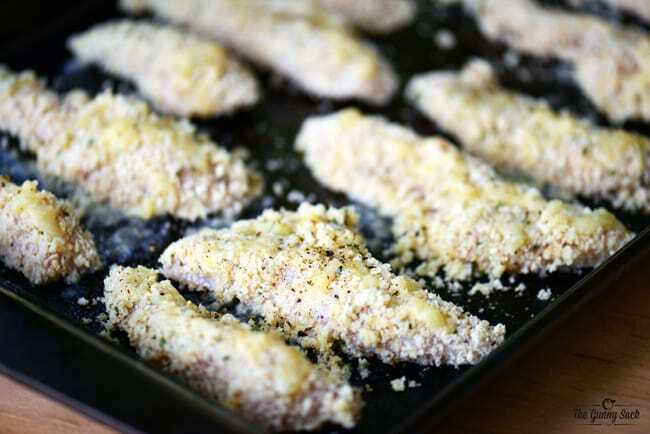 A 30 minute, kid-friendly recipe for crispy, baked, Lemon Pepper Chicken Tenders that are crunchy and flavorful on the outside and tender and juicy on the inside. My family loves garlic parmesan chicken tenders and since I don’t like frying food I had to come up with a more hands-off way to make crispy chicken tenders. With these Lemon Pepper Chicken Tenders, all you have to do is coat the chicken and let the oven do the rest of the work. 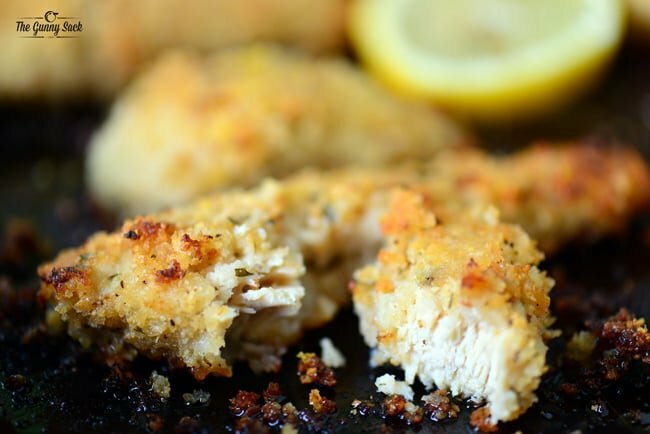 A few months ago I shared a recipe for Key Lime Chicken Tenders and that recipe, along with this one for Lemon Pepper Chicken Tenders are two of the recipes from my blog that I make the most. Melt the butter and stir in the lemon juice. In a separate bowl, combine panko, breadcrumbs, grated parmesan, garlic powder, salt, ground pepper, parsley, oregano, onion powder and grated lemon peel. Cut four boneless, skinless chicken breast into three or four strips, depending on how thin you want your chicken tenders to be. Another option would be to cut the chicken into smaller pieces to make chicken nuggets. 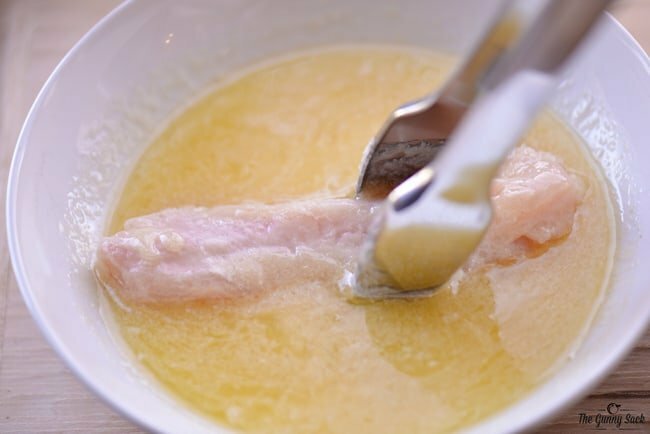 Dip the chicken pieces in the melted butter and lemon juice mixture. Place them on a greased baking sheet and sprinkle with additional pepper, if desired. Bake at 400 degrees for 20-25 minutes, until cooked through. To brown the chicken tenders a bit more, put them under the broiler for a couple of minutes. These Lemon Pepper Chicken Tenders are crunchy and flavorful on the outside while remaining tender and juicy on the inside. 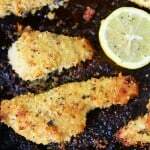 When I made baked these chicken tenders, my kids and my husband were gone. So, I brought the chicken tenders over to my sister’s house and shared with her family. Everyone seemed to love them as much as we do! 1. How to make chicken nuggets? Cut the chicken breasts into nugget size instead of tenders and then follow the rest of the recipe. 2. Can I leave the lemon juice and lemon peel out? Yes, you can make the recipe as written but skip the lemon juice and lemon peel. 4. How do you make fried chicken tenders? Follow steps 1-5 to cut and coat the chicken. Then, heat two tablespoons of oil in a large non-stick skillet over medium heat. Cook about 6 chicken tenders for 3-4 minutes per side until the fully cooked. Repeat the process with more oil and chicken tenders. Do not overcrowd the chicken in the pan or it won’t be able to get crispy. 5. How to prevent soggy chicken tenders? Try cooking the chicken tenders on a wire baking rack on top of the baking sheet if you are having issues with getting crispy tenders. 6. How can I make my lemon pepper chicken tenders even crispier? After cooking them, brown them under the broiler for a couple of minutes. 7. How to keep chicken tenders from sticking to the pan? Allow them to cool a bit and then use a thin, metal spatula/turner to scrape the chicken tenders along with the breading off the pan. In a small, wide bowl melt the butter and stir in the lemon juice. 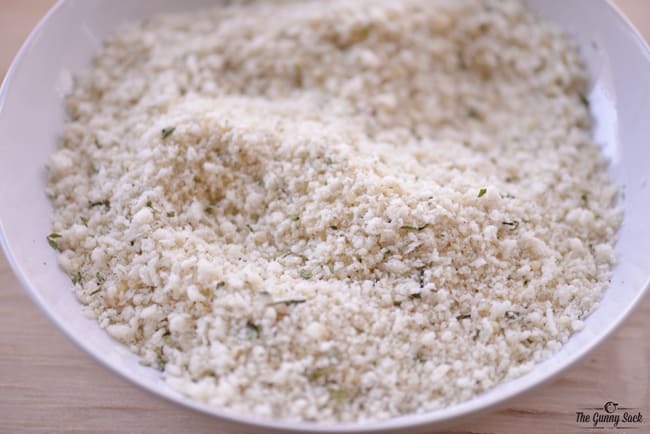 In a separate small, wide bowl, mix together panko, breadcrumbs, grated parmesan, garlic powder, salt, pepper, parsley, oregano, onion powder and grated lemon peel. Dip the chicken tenders into the butter mixture. 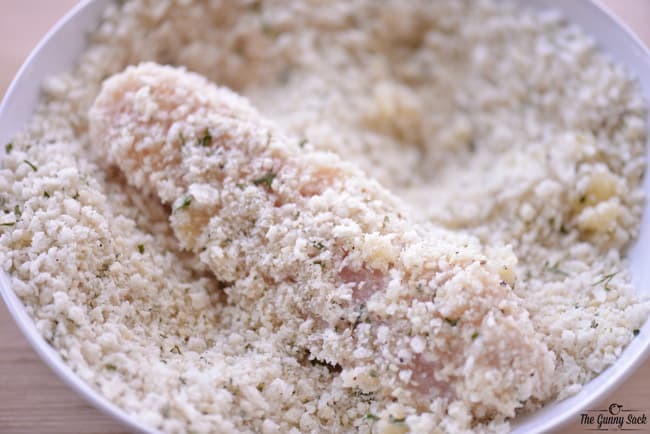 Coat the chicken tenders with the breadcrumb mixture. Place them on a greased baking sheet and sprinkle with additional ground pepper, if desired. 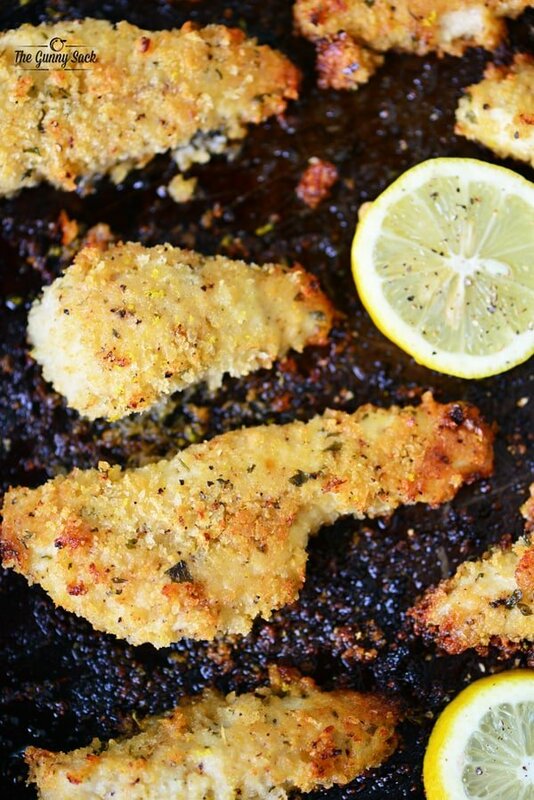 Click here to save this recipe for Lemon Pepper Chicken Tenders to your Pinterest Boards. My breading sticks to the pan and the skin that is remaining is soggy…what am I doing wrong? Any tips appreciated! If mine don’t get crispy enough, after baking them, I put them under the broiler for a couple minutes. You could also try baking them on a wire baking rack on the baking sheet instead of baking them directly on the baking sheet. Also, once they finish baking, allow them to cool for several minutes, then use a thin, metal spatula/scraper to scrape the chicken tender and breading off of the pan. If all else fails, you can pan fry the chicken tenders instead. Thank you so much for this recipe! I love it and so does my husband. Will be making again for sure. I made it with 1.5 lbs so added a little extra of each ingredient. Yum! I’ve made these several times. They’re delicious! Even my picky kids like them! I sprinkle with lemon pepper before I bake them. Tried these twice. Baking just leaves the coating soft. Second tI’m I pan fried in a bit of olive oil. Huge improvement in texture. I tried this recipe with 1.75 pounds of chicken tenderloins and there was more than enough breeding for all of it! Very yummy! Is the Parmesan cheese just for added flavor? What is thr benefit of frying then baking? Can i just fry instead? These chicken tenders are only baked…not fried but you can fry them instead if you prefer. We love pairing lemon pepper with chicken! Can’t wait to try these chicken tenders! 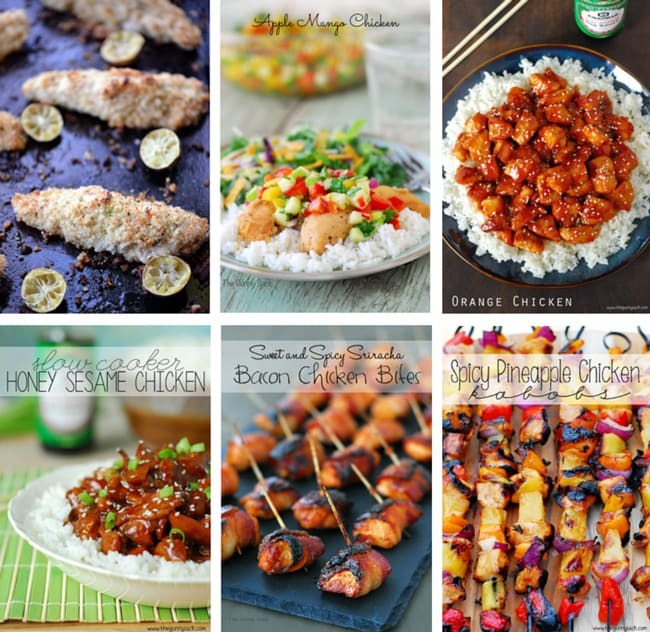 Yum – thank you – nice and easy!